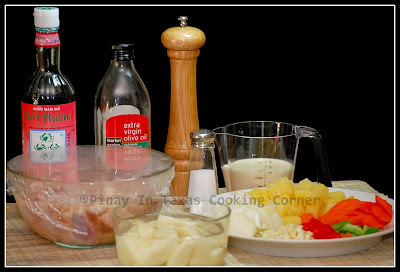 Piniyahang Manok (Pineapple Chicken) is another dish that Filipinos love. 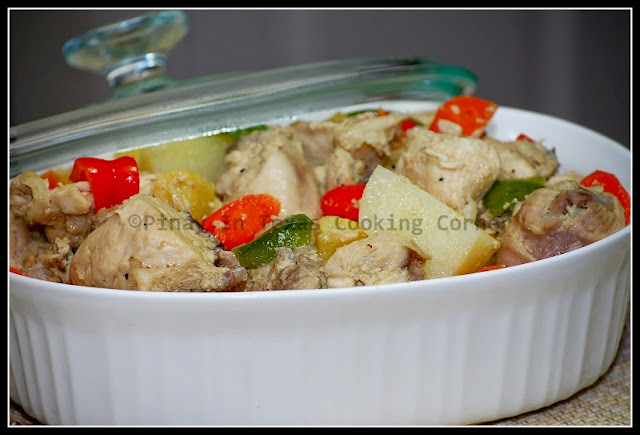 It is basically chicken marinated in pineapple juice then cooked with pineapple chunks. There are different versions of pininyahang manok. The main difference is the kind of milk used for the sauce. This is commonly cooked with coconut milk but there are some who use fresh or evaporated milk. I prefer using evaporated milk. This for me blends better with the taste of pineapple. There are also some who cook this dish with tomatoes. I don’t. Tomatoes for me overpower the taste of pineapple which is supposed to be the main flavoring agent for this dish. This is one chicken dish my family loves so much. I guess the tender pieces of chicken and the sweet and mildly sour pineapple chunks in a creamy sauce make this dish irresistible! See for yourself! * I shared this recipe on Friday Potluck @ EKat's Kitchen, Fresh Bites' Friday, and Foodie Fridays Bloghop 3. 2 large potatoes, each cut into 8 pcs. 1. Sprinkle chicken with salt and pepper. Marinate in pineapple juice from the canned pineapple chunks for at least 30 minutes. Drain, setting aside the marinade. 3. Add chicken and sauté until juice starts to come out. Add the marinade and simmer for about 15 minutes or until chicken is almost tender. 4. Add the pineapple chunks and fish sauce. Simmer for another 5 minutes. 5. Add the milk and potatoes. Simmer until potatoes are almost cooked, that is about 10 minutes. Stir to avoid curdling. 6. Add salt and pepper to suit your taste. Add the carrots and bell pepper then simmer for 5 minutes more. 7. Remove from heat. Serve hot with rice. Hi there! Thank you for linking up to the Feed Me Tweet Me Follow Me Home Blog Hop. I've followed your blog and followed you on Twitter. I love the pineapple chicken recipe - it sounds wonderful! Hey, thanks for dropping by and for the follow! I'm following you back! Looking forward to reading more of your posts! Thanks so much for linking with Friday Potluck! If you get the chance, please add a link back to FP so that others visiting your blog can come check out FP! :) I love pineapple and chicken flavors combined. Lovely recipe. Thanks for following my blog. Can't wait to see what you're cooking up next. I'm your newest follower. :) Have a wonderful weekend. Cristina, I am so sorry, call it a cold medicine induced blond moment! You have been such a great and supportive Friday Potlucker this week. Oh my, what a tasty dish! I have never had chicken with pineapple, but I can imagine the flavors and I am loving it. Thank you for the recipe!! Hi, you have ginger on the ingredients list but it's not on the procedure. Thanks for that! Ginger is sauteed together with the garlic. hi tins. just dropping by. i need your pininyahang manok today. thanks for saving my day! hugs!